This is one of the most important lessons that children will ever learn. Easter is not about bunnies and egg hunts, but it is about Jesus rising from the dead. Through this lesson children will learn that Jesus’ tomb was empty and he is alive today. Learning Aim: Jesus is Alive. You say the Italicized words. Non-italicized words are directions. Tell the class that they are going to learn a very special lesson today. Use play-doh to build a tomb and a stone to roll in front of the door to the tomb. Show it to the class and talk about Jesus died and then rose again. Remind them that Jesus is God’s son and He to Earth to be their Savior. Talk about what they learned about last week when everyone forgot that Jesus was a King and He was killed. Help the kids each make their own tomb. Let them play with the play-doh for a few minutes and then put everything away except for one tomb which you will use as part of the story. Say, Last week we learned that Jesus died for us. It made me so sad to know that Jesus died, but today’s lesson is going to be a little bit happier. Thankfully Jesus didn’t stay dead for very long! Let’s listen to the story from John 20:1-18. Early in the morning, three days after Jesus died, Mary Magdalene went to the tomb where Jesus was buried. The tomb looked like this one that we made out of play-doh. Whenever Mary got to the tomb she knew something was wrong because the big stone door was rolled away. Roll your play-doh stone away. Mary Magdalene was very worried. So she ran to one of Jesus’ disciples who was named Simon Peter and said, ‘They have taken the Lord out of the tomb and I don’t know where they put him!’ Can you imagine how worried Mary was? So Simon Peter and another disciple ran to the tomb. The other disciple got there first and started looking at the cloth that Jesus was wrapped in. Simon Peter got there and ran right into the tomb. They believed that Jesus was gone but they didn’t know where he was. They were very worried and went home. But Mary went back to the tomb and stood outside of it crying. As she cried she looked into the tomb and you won’t believe who was in there. Any guesses? It was two angels wearing all white. 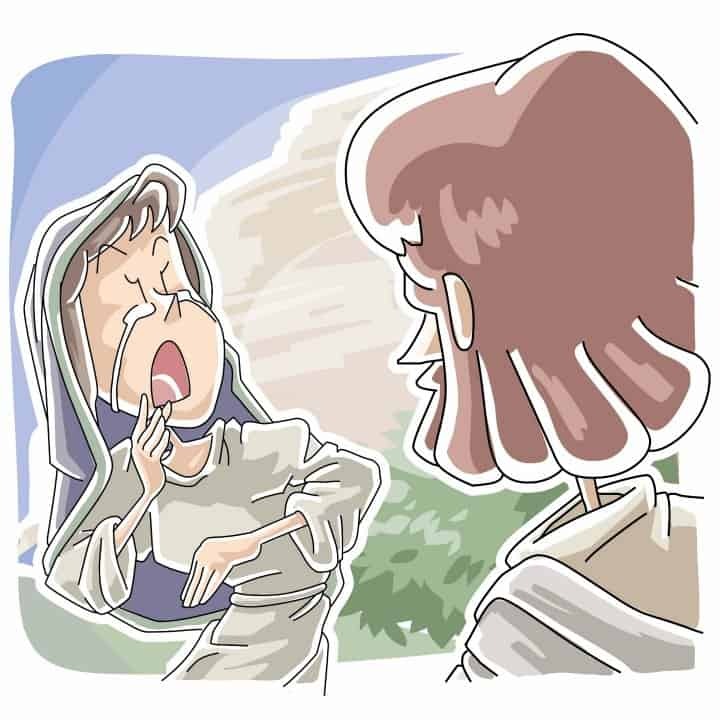 Mary still didn’t realize that she was actually talking to Jesus. Can you imagine how surprised she is going to be when she finds out Jesus is alive? Jesus said to her, ‘Mary.’ And she knew that it was Jesus. She ran to him and hugged him tight. Jesus really was there and he was alive! But Jesus told her not to just stand there and hug him. She needed to go and tell everyone that he was alive and that soon he would be going back up to Heaven to be with God. This is the most amazing Bible story that you will ever hear. Jesus died so that we can go to Heaven someday. Jesus is God so he didn’t stay dead. He conquered death and He is alive right now. Give each child a white paper or foam bowl. This will be Jesus’ tomb. Color or paint it gray. Cut a hole on the side of it for the tomb opening. Ball up a piece of gray construction paper for the stone. Write ‘He is Alive’ on the top of the tomb, which is actually the bottom of the upside down bowl. As the kids work say, Whenever you see this craft let it be a reminder that Jesus died for you but He didn’t stay dead. He got out of His tomb and the tomb is empty. He is alive today. You will need 6 paper cups and a few large Easter eggs to act as a bowling ball. Write ‘Jesus is Alive, He has Risen’ on the cups (one word on each cup). Work together to put the cups in order and then discuss what they say. Then, put the cups in a triangle shape and use the Easter egg to bowl and knock the cups down. Hide eggs around the classroom or another open area. Let the kids try to find them. Leave the eggs empty. Explain that the eggs are empty because the tomb was empty and the greatest gift we could ever receive is Jesus who died for us then rose from the grave. Sit in a circle and play catch with an Easter egg. Each time a child catches the egg they have to say, ‘Jesus is Alive.’ When you are finished playing open the egg and say, This Easter egg is empty just like Jesus’ tomb was empty. Jesus is alive today and He loves you! Close in prayer. Tony Kummer (Editor) reviewed & updated this page on : June 6, 2016 at 12:03 am. All our content is peer reviewed by our readers, simply leave a comment on any post suggest an update.